Day Books of Sharon Frost, turning the page. When I started blogging my drawings I was working in small bound books (Moleskines), one drawing a day: bound drawings that somehow maintained a daily narrative, inseparable from their collective physical context. As time went on, the drawings became more complex and more enmeshed in an on-going thought process. They start one day and finish whenever they finish and I work in several sketchbooks at the same time, of various sizes. And the pages are now removable. I work with internal (anatomy, a continuing fascination) and external (flux of experience and environment). And, over the last 10 years I’ve been experimenting with in-image captions, more and more in Spanish. (Drawings are pencil, ink, watercolor, whatever on paper: various sketchbooks, going one book to the next. And the pages are now removable. All art copyright Sharon Frost, sharon.frost@gmail.com, sharonfrost.net). My Work and Its Context. I'm featured (and interviewed) in this issue. I was included in this exhibition, Spring 2014. Cervantes Institute in New York City. 5 7/8 x 9 in. ; watercolor, ink, whatever, on Stonehenge paper. 6 x 12 in. double-page spread; watercolor, ink, whatever, on Canson paper. Time pases, rain-soaked and slow, better inside. Charlie Haden,Pat Metheny in Jerez de la Frontera. 29 November, 2010. 8 1/4 x 10 in. 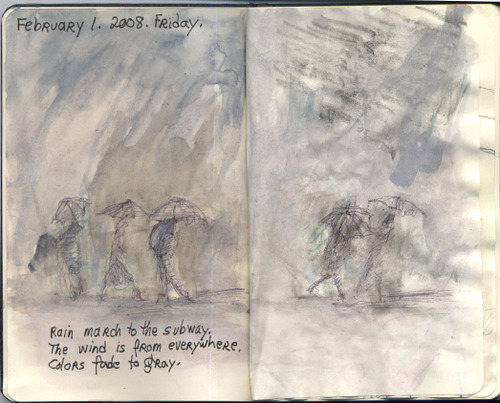 double-page Moleskine cahier spread; watercolor, ink, whatever (sherry) on paper. Rainy season. 17 November, 2010. 8 1/4 x 10 in. double-page Moleskine cahier spread; watercolor, ink, whatever on paper. And the Cruz Blanca, open again, reliable. 5 x 7 in. ; watercolor, ink, whatever, on paper. Viene el calefactor. Lluvia y frío en Jerez: qué raro (una novedad). 17 Noviembre, 2010. Enter the heater. Rain and cold in Jerez: how strange (a novelty). 8 1/4 x 10 in. Moleskine cahier double-page spread; watercolor, ink, whatever, on paper. Soggy in Bryant Park. October 9-11, 2010. Static transitions by the F train. September 21-Oct.1, 2010.